This morning I couldn’t face another cup of non-Peets coffee. Not when we have two bags of freshly ground and delivered Peets waiting. But while we were waiting for the delivery we ran out of old stuff and our friend Chris generously brought us a bag of Julius Meinl which is perfectly fine coffee. At least, it’s great when they brew it. But when we brew it, Dave says it tastes like Folgers. And this morning I wanted a cup of really, really good coffee, not just coffee that you have to drink fast before it gets bitter. 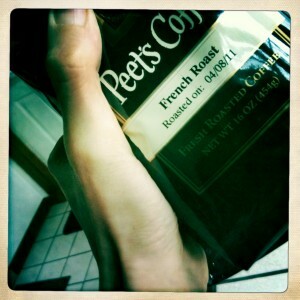 So I snuck downstairs without hitting snooze, and opened the Peets while there was still Julius Meinl in the canister. God, we’re spoiled. We’re bombing Libya and I’m worried about the order in which we consume various packages of premium coffee? I can’t stand us sometimes. Hey, NEVER underestimate a cup of REALLY good coffee. Coffee press anyone? I threw out the remaining Julius Meinl coffee. The cups that Chris brought the other day were excellent, but the ground coffee from the vacuum-sealed bag tasted like garbage. Maybe it’s how we brew coffee (in individual Melitta filters, directly into our preferred mugs), or maybe it’s that we’re just accustomed to Peet’s. All I know is that life is too short for bad coffee. Especially when you have good coffee on the premises. As a fellow coffee snob, I concur. ‘Cept I’m an Intelligentsia man myself. Are you sure you’re not a Cylon?